Chantal Marleau and her horse, Harlequin, attend their first clinic, wrapping up “A Year of Firsts” with Josh Nichol. It is said that life’s greatest lessons come from the journey, not the destination. And so, inspired by all they have learned over the past 12 months, Chantal Marleau and her young horse, Harlequin, traveled to their first Josh Nichol clinic to put their home schooling to the test. Here, she shares their experience, as well as Nichol’s words of wisdom for moving forward in their training. As we made our way to our first clinic, I wondered what awaited us at this next juncture in my young horse’s life. As an amateur, had I inadvertently created holes in his training? Were we ready to graduate from the basics learned in the Year of Firsts series? Surprisingly, we would struggle in areas I believed we had mastered and excel where we had previously failed. In the end, however, we would emerge a stronger team than ever before. The beginning of our clinic was uneventful. Harlequin has always readily adapted to new surroundings and this was no exception. “This is not always the case,” noted Nichol. “Often, a new environment can overwhelm a young horse. When this happens, one needs to first address the mind. “Imagine yourself at Disneyworld for the first time,” said Nichol. “There are rides, costumed characters, restaurants and crowds of people. It would be unnatural to not want to take it all in. “Now, imagine that someone tugs at you every time you look around. You will eventually either retreat into yourself or explode. How you choose to react depends entirely on the type of person you are. I wondered if I habitually clenched the lead rope, or if the clinic was making me particularly anxious? Harlequin’s health had recently suffered a temporary setback and we had been forced to take yet more time off. As a result, I was not feeling entirely prepared for this clinic. In addition, although we had started in western tack, Harlequin’s saddle no longer fit properly and we would be working in his dressage saddle for one of the first times. As a predominantly English rider, I was comfortable with this choice, but how would my young horse react? To make matters worse, Harlequin had recently developed a tendency to bolt and spook in the far corner of my arena, and my confidence in the saddle had been compromised. Nichol quickly assessed that my anxieties were the underlying cause of our struggles. “It doesn’t take long to figure out where the root of every problem lies,” he said. “It always traces back to an area where a rider has failed to satisfy a horse’s basic needs.” In our case, Nichol helped me realize that when stressed, I have a tendency to dictate responses with my hands, which is not at all good leadership. I turned my attention to the hand holding the lead rope while asking Harlequin to move out of my space and circle and realized that I was indeed directing his head in many instances. I immediately vowed to consciously refrain from closing my hand on the lead rope – even slightly – until I trained new habits in myself. When I adopted Harlequin, he had already been purchased at a meat auction and had gained experience holding his own among heavy horses at the feedlot. He was confident and pushy. Although the yield within my young horse has greatly improved since then, Nichol helped me see that even now, Harlequin’s shoulder sometimes presses into me. Not having adequately addressed this, Harlequin had learned that I am not sufficiently assertive while leading the space. “The proof is that it takes a lot of energy to inspire the trot and canter,” he noted. “The solution is to apply a great deal more pressure towards the hip when asking for these gaits. If that means having the flag bump your horse, that’s okay. “It’s best to make contact with the horse’s cinch line though, not the hip, because some horses kick out as a reminder of the dull contract you previously signed. 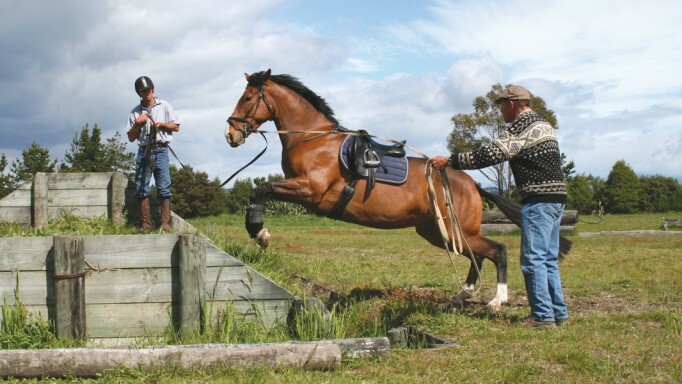 In fact, expect your horse to kick or jump out of your space as you negotiate a new understanding. This is just conversation. Apparently, returning to basics from time to time really is a good idea. Yielding to the mounting block was an exercise we had long ago mastered, or so I thought. I immediately became more insistent with my flag, tapped his hindquarters with increasing pressure and released as soon as Harlequin began to yield away from the flag and towards the mounting block. The next attempt was much improved. Setting up my horse for more successes would continue to be the underlying theme throughout our clinic. 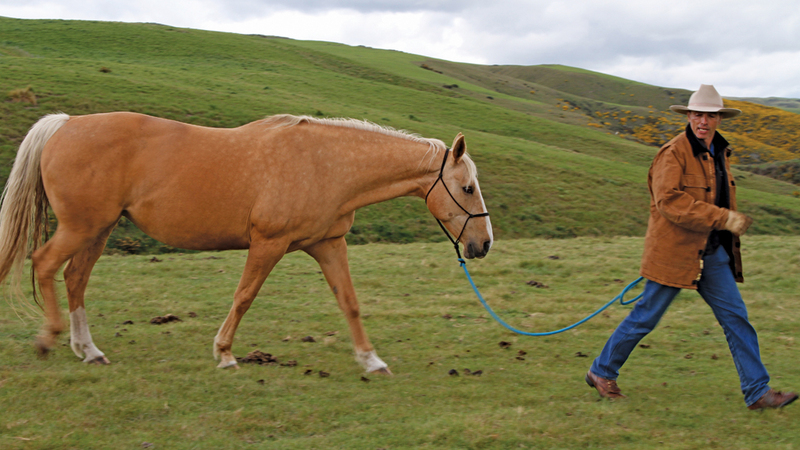 We began by reviewing the basics of training a young horse to move under saddle. “In the beginning, what we accept as the right answer to our questions has to be broader than what we expect from a higher level horse,” said Nichol. “The most relevant example is asking a horse to move forward. “With a schooled horse, I have a reasonable expectation that he should move in a very specific direction. With a young horse, however, I use a 180-degree rule. First, I imagine a line that intersects my intended direction of travel. Then, as I ride from point A to B, I encourage any forward motion within 180-degrees of that line. “I will not correct a horse if he is moving forward despite veering slightly to the left or right. This provides a clear reward for forward. “If, however, my horse turns away and crosses the 180-degree limit, I will point my core towards where I want to go, softly pick up the inside rein and help guide my horse. As soon as he commits to following my lead, I once again drop my rein. 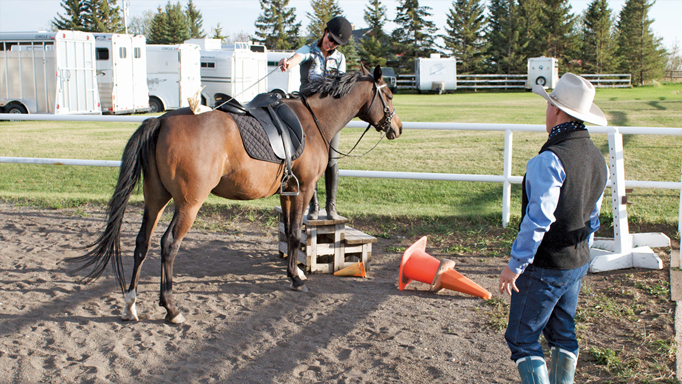 “Often, riders who have been trained in English disciplines are quick to pick up their reins. Although contact has its place as a horse advances, it creates a feeling of confinement in the beginning. Apparently, I am inclined to unconsciously look for contact. Worse, given our recent spooking episodes, I sometimes clutch the rein as though it might help pre-empt another dangerous situation. As we practiced the 180-degree exercise at the walk, I focused on remaining supple and allowing Harlequin to look around. Whenever I felt Harlequin’s interest in things outside of the arena escalate, I gently touched the inside rein and held it until I could see his eyelashes. This technique immediately helped Harlequin remain softly focused on me. When we approached the far corner, however, I felt him tighten as he spotted a horse whose head was deeply buried in a metal trough. I fought a strong urge to grip the rein, momentarily fearing that my horse might bolt. Harlequin briefly refocused on me as I picked up the inside rein, but he quickly circled back to take another look at the headless horse. “Since you are retraining a habit to grab the rein, focus on staying balanced in the saddle, agree to go with your horse and once he is relaxed, ask him to continue in another direction,” said Nichol. I could hardly believe how beautifully this worked. Taking the training home would prove just as effortless. 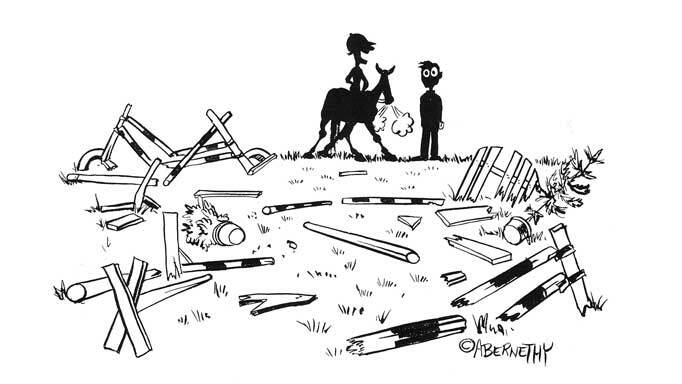 There are no longer terrifying corners in my arena; our bolting and spooking issues are in the past. As this chapter in our training comes to a close, I find renewed joy in contemplating the lessons ahead and cannot help but wonder where our journey will lead us next. “It is my hope that as we conclude this series, I might have helped create an understanding that horses are beings whose language is based on energy and yield. In order to communicate with them well, we need to clearly present our intentions, lead the space and attend to their basic needs. 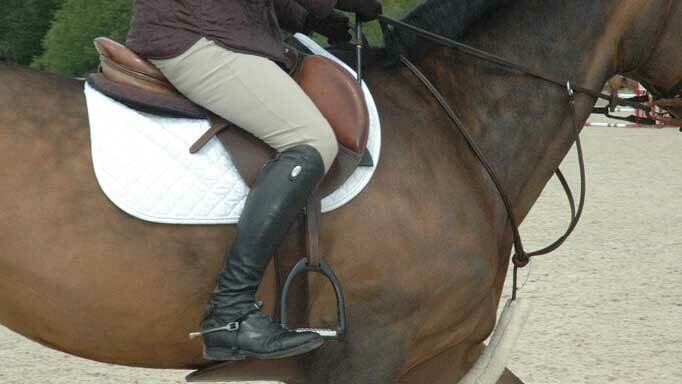 Jenn Serek offers advice on whether to cross or drop stirrups in the equitation ring.